At Google I/O 2010, we announced that there are over 60 Android models now, selling 100,000 units a day. When I wear my open-source hat, this is exciting: every day the equivalent of the entire population of my old home city starts using open-source software, possibly for the first time. When I put on my hat for Android Compatibility, this is humbling: that’s a whole lotta phones that can all share the same apps. Another thing we launched at Google I/O was an upgraded and expanded source.android.com. The new version has refreshed info on the Android Open-Source Project, and some new tips and tools for device manufacturers — useful if you’re an OEM. However, it also has details on the Android compatibility program, now. This is also aimed mostly at OEMs, but Tim Bray suggested that developers might be interested in a peek at how we keep those 100,000 devices marching to the same beat, every day. So here I am, back on the blog. I remember sitting with my colleagues in a conference room in Building 44 on November 5, 2007, listening to Andy Rubin and Eric Schmidt announce Android to the world. I remember a lot of the press stories, too. For instance, Android was “just words on paper” which was especially entertaining since I knew we were getting ready to launch the first early-look SDK a mere week later. Another meme I remember is... yes, “fragmentation”. Literally before the close of business on the same day we announced Android (4:46pm to be precise), I saw the first article about Android “fragmentation.” The first day wasn’t even over yet, and the press had already decided that Android would have a “fragmentation” problem. The thing is, nobody ever defined “fragmentation” — or rather, everybody has a different definition. Some people use it to mean too many mobile operating systems; others to refer to optional APIs causing inconsistent platform implementations; still others use it to refer to “locked down” devices, or even to the existence of multiple versions of the software at the same time. I’ve even seen it used to refer to the existence of different UI skins. Most of these definitions don’t even have any impact on whether apps can run! Because it means everything, it actually means nothing, so the term is useless. Stories on “fragmentation” are dramatic and they drive traffic to pundits’ blogs, but they have little to do with reality. “Fragmentation” is a bogeyman, a red herring, a story you tell to frighten junior developers. Yawn. Now, that’s not to say that there aren’t real challenges in making sure that Android devices are compatible with each other, or that there aren’t very real concerns that keep app developers awake at night. There definitely are, and I spend a great deal of time indeed thinking about them and addressing them. The trick is to define them clearly. Bugs - devices might simply have bugs, such as a buggy Bluetooth driver or an incorrectly implemented GPS API. Missing components - devices might omit hardware (such as a camera) that apps expect, and attempt to “fake” or stub out the corresponding API. Added or altered APIs - devices might add or alter APIs that aren’t part of standard Android. Done correctly this is innovation; done poorly and it’s “embrace and extend”. Each of these is an example of something that can make an app not run properly on a device. They might run, but they won’t run properly. These are the things that I spend my time preventing. As stewards of the platform we realize that it’s vital to allow only compatible devices to participate in the Android ecosystem. So, we make compatibility a strict prerequisite for access to Android Market and the right to use the Android name. This means that developers can rely on the fact that Android Market — the keystone of the Android ecosystem — will only allow their apps to run on compatible devices. It’s pretty self-evident that a single app ecosystem is better than many small ones, so OEMs are generally pretty motivated to ship compatible devices. But motivation alone doesn’t get us very far without tools to actually ensure compatibility, which is where the Android compatibility program comes in. This program is like a stool with three legs: the Android source code, the Compatibility Definition Document, and the Compatibility Test Suite. It all starts with the Android source code. Android is not a specification, or a distribution in the traditional Linux sense. It’s not a collection of replaceable components. Android is a chunk of software that you port to a device. For the most part, Android devices are running the same code. The fact that all Android devices run the same core Android code goes a long way toward making sure those devices all work the same way. However, this doesn’t solve the problems of missing components or altered APIs, because the source code can always be tweaked. This is where the Compatibility Definition Document (or CDD) comes in. The CDD defines in gory detail exactly what is expected of Android devices. It clearly states, for example, that devices may not omit most components, and that the official Android APIs may not be altered. In a nutshell, the CDD exists to remove ambiguities around what’s required of an Android device. Of course, none of that overcomes the simple reality of human error — bugs. This is where the Compatibility Test Suite comes in. The CTS is a collection of more than 20,000 test cases that check Android device implementations for known issues. Device makers run the CTS on their devices throughout the development process, and use it to identify and fix bugs early. This helps ensure that the builds they finally ship are as bug-free as possible. We’ve been operating this compatibility process with our OEM partners for over a year now, and it’s largely responsible for those 60+ device models being interoperable. However no process is ever perfect and no test suite is ever 100% comprehensive, and sometimes bugs get through. What happens then? Well, we have great relationships with our OEMs, and like I said, they’re motivated to be compatible. Whenever we hear about a serious bug affecting apps, we report it to our partners, and they typically prepare a bugfix release and get it out to end users. We will also typically add a test case to the CTS to catch that problem for future devices. It’s an ongoing process, but generally our partners are as interested as we are in the user experience of the devices they sell. The mobile industry today is “very exciting”, which is code for “changes painfully fast”. We believe that the only way Android will be a success is to keep up with that change, and ultimately drive that change. This means that over time, the CDD will also change. We’ll add new text to handle problem cases we encounter, and the actual requirements will change to accommodate the innovations happening in the field. For example, in the 2.1/Eclair CDD, we tweaked the CDD slightly to make telephony optional, which allows Android to ship compatibly on non-phone handheld devices. Whenever we do this, of course, we’ll make corresponding changes to the Android APIs and Android Market to make sure that your apps are protected from ill effects. On a somewhat related note, a lot of ink has been spilled on the fact that there are multiple versions of Android out there in users’ hands at the same time. While it’s true that devices without the latest software can’t run some of the latest apps, Android is 100% forward compatible — apps written properly for older versions also run on the newest versions. The choice is in app developers’ hands as to whether they want to live on the bleeding edge for the flashiest features, or stay on older versions for the largest possible audience. And in the long term, as the mobile industry gets more accustomed to the idea of upgradeable phone software, more and more devices will be be upgraded. As a developer, you simply decide what features your app requires, and list them in your app’s AndroidManifest.xml. The Android compatibility program ensures that only compatible devices have access to Android Market. Android Market makes sure your app is only visible to those devices where it will run correctly, by filtering your app from devices which don’t have the features you listed. There almost certainly will be devices that have access to Android Market that probably weren’t quite what you had in mind when you wrote your app. But this is a very good thing — it increases the size of the potential audience for your app. As long as you accurately list your app’s requirements, we’ll do the rest and make sure that your app won’t be accessible to a device where it won’t run properly. After all, we’re app developers ourselves, and we know how painful it is to deal with users upset about an app not working on a device it wasn’t designed for. Now, that’s not to say that we think our current solution is perfect — no solution is. But we’re continuously working on improvements to the SDK tools and Android Market to make your life as an Android developer even easier. Keep an eye on this blog and on the Android Market itself for the latest info. In the just-launched Android 2.2, we’ve added a new service to help developers send data from servers to their applications on Android phones. Android Cloud to Device Messaging (C2DM) makes it easier for mobile applications to sync data with servers. Most of the useful applications on your mobile phone use the Internet to keep users connected. Traditionally, many apps use polling to fetch data periodically. POP mail clients, for example, connect to the server every 15 minutes or so. Polling is fairly easy to implement, and works well in many situations. It’s tricky, though, to select the frequency: Poll too often, you may not see any new data, and create unnecessary stress on the server and network. Poll too rarely and the data on the device may become stale. Polling is especially problematic on mobile devices, because it consumes precious network bandwidth and battery life. Having the server push messages to the client asynchronously may be a superior choice for getting the latest data to your applications, resulting in fresher data and more efficient use of the network and your battery. However, it’s also tricky to implement a good push solution, and it isn’t free as there is some overhead in maintaining the required connection. On a mobile device like an Android phone, implementing applications to receive these messages is tricky; you have to worry about patchy network coverage and zombie connections created when the wireless carrier’s routers time out connections that are idle for too long. Many of the Google applications on Android already use push to keep their data fresh, for example Gmail, Contacts, and Calendar. Starting with Android 2.2, C2DM allows third-party developers to use the same service the Google apps do. It requires Android 2.2; C2DM uses Google services which are present on any device running the Android Market. It uses existing connections for Google services. This requires the users to sign into their Google account on Android. It allows 3rd party servers to send lightweight data messages to their apps. The C2DM service is not designed for pushing a lot of user content; rather it should be used like a “tickle”, to tell the app that there is new data on the server, so the app can fetch it. An application doesn’t need to be running to receive data messages. The system will wake up the app via an Intent broadcast when the the data message arrives, so long as the app is set up with the proper Intent Receiver and permissions. No user interface is required for receiving the data messages. The app can post a notification (or display other UI) if it desires. To enable C2DM, an application on the device registers with Google and get a registration ID, and sends the ID to its server. When the server needs to push a message to the app on the device, it posts the message via HTTP to Google’s C2DM servers. The C2DM servers route the message to the device, and an Intent broadcast is sent to the app. The app is woken up to process the message in its Intent Receiver. The app can unregister with C2DM when the user no longer wants messages to be pushed to it. The registration ID will be delivered back to your app via an intent broadcast with the Intent Action com.google.android.c2dm.intent.REGISTRATION. Here is a code sample to receive the registration ID. // Registration failed. Try again later, with backoff. // Send the registration ID to the app’s server. // Be sure to do this in a separate thread. URL encoded parameters including the registration id, the data key/value pairs, a “collapse key” used for overriding old messages with the same key on the Google C2DM servers, and a few other optional params. When you use the C2DM service, you no longer need to worry about dealing with flaky mobile data connections, or when the user isn’t connected to the internet (i.e. Airplane mode). C2DM keeps the messages in the server store, and delivers them when the device comes back online. Basically, you can leave all the hard work of designing a robust push service to Google. Your application can take advantage of push infrastructure we’ve already built and tested, and stay more connected to the internet. Best of all, you won’t ruin the users’ battery life. Information about how to build C2DM enabled applications on Android is online at the code lab, and more will be coming as we approach general release. As the tech lead for the Dalvik team within the Android project, I spend my time working on the virtual machine (VM) and core class libraries that sit beneath the Android application framework. This layer is mostly invisible to end users, but done right, it helps make Android devices run smoothly and improves developer productivity. The 2.2 release is particularly pleasing to me, as it is the first release since before 1.0 in which we have been able to deliver significantly new VM technology. And unlike much of what my team and I do, it is something that can be experienced directly by end users. “Dalvik” isn’t exactly a household word (at least in my country), and most people wouldn’t know a virtual machine if it hit them in the face, but when you tell them you were able to make their existing device work better — run faster, use less battery — they will actually take notice! We added a Just In Time (JIT) compiler to the Dalvik VM. The JIT is a software component which takes application code, analyzes it, and actively translates it into a form that runs faster, doing so while the application continues to run. If you want to learn more about the design of the Dalvik JIT, please watch the excellent talk from Google I/O 2010 given by my colleagues Bill Buzbee and Ben Cheng, which should be posted to YouTube very soon. To be clear, the differences aren’t always dramatic, nor do they apply uniformly to all applications. Code that is written to run the CPU all-out can now do more in the same amount of time (running faster), and code that is written to be rate-limited can get its work done using less time and less of the CPU (using less battery). On the performance front in particular, we have seen realistic improvements of 2x to 5x for CPU-bound code, compared to the previous version of the Dalvik VM. This is equivalent to about 4x to 10x faster than a more traditional interpreter implementation. Many previous JIT implementations react slowly, delivering performance improvements only after a long warm up period. In the extreme, it can be minutes or even hours before the code is fully up to speed. On the other hand, the Dalvik JIT reacts quickly, so that mere moments after you hit the “Start” button on your favorite game, you are already benefiting from the work of the JIT. We are also very pleased with how little memory the JIT uses. The code for the JIT itself is well under 100k, and each process that the JIT runs in will typically only use another 100k or so of RAM. On the current generation of Android phones, device users won’t even notice this additional memory usage; on my own phone, I can still have literally dozens of applications warmed up in memory and ready to go. 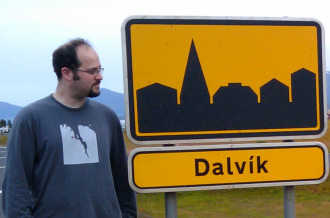 The Dalvik team isn’t resting on its laurels, either. We are hoping to see the Dalvik JIT deployed on many devices in the coming months. Looking forward, the team has an endless list of ideas for making the VM and library code better, which we are diligently working on. The upcoming release of Android will include a new bug reporting feature for Market apps. Developers will receive crash and freeze reports from their users. The reports will be available when they log into their Android Market publisher account. 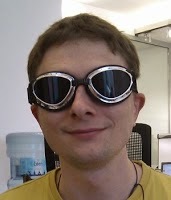 No more blind debugging! When an app freezes or stops responding, the user can send a bug report to the developer with a click of a button, right from their phone. The new button appears in the application error dialog; if the user chooses to click it, the Google Feedback client running on the device will analyze the offending app and compose a report with information needed to diagnose it. The system is set up with user privacy in mind — the app developer will not receive information which could identify the user in any way. The user can also preview all information that will be sent. If users choose to do so, they may also send additional system information like device logs. Because there is a chance these may contain private information, they will not be passed on to the developer; they will be used by Google to track down bugs in the Android system itself. 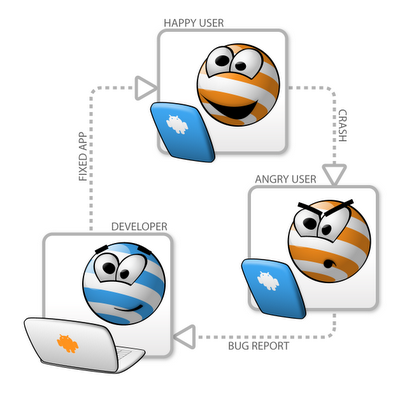 On the receiving end, developers will get tools to diagnose, triage and fix bugs in their apps. A popular app can generate hundreds of thousands of reports. Google Feedback aggregates them into "bugs" - individual programming errors. 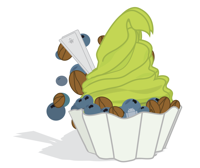 Bugs are displayed to developers sorted by severity, measured as the rate at which reports for the bug are flowing in. Clicking on a bug will display information such as stack traces, statistics about which type of hardware the bug occurred on and what versions of the app the user was running. In case of freezes, stack traces for all threads in the app will be displayed. This data should give developers a good idea how well their apps are faring in the wild. Google is constantly working on improving and extending the feedback feature to provide developers with tools to improve the quality of their apps. The benefits should be felt by both developers and their users. 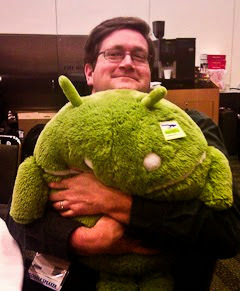 Android 2.2 and developers goodies. Performance & speed: The new Dalvik JIT compiler in Android 2.2 delivers between a 2-5X performance improvement in CPU-bound code vs. Android 2.1 according to various benchmarks. New enterprise capabilities: We’ve added Exchange capabilities such as account auto-discovery and calendar sync. Device policy management APIs allow developers to write applications that can control security features of the device such as the remote wipe, minimum password, lockscreen timeout etc. Rich set of new APIs and services: New data backup APIs enable apps to participate in data backup and restore, allowing an application's last data to be restored when installed on a new or a reset device. Apps can utilize Android Cloud to Device Messaging to enable mobile alert, send to phone, and two-way push sync functionality. Developers can now declare whether their app should be installed on internal memory or an SD card. They can also let the system automatically determine the install location. On the native side, a new API now gives access to Skia bitmaps. Additions to Android Market: Android Market provides Android Application Error Reports, a new bug reporting feature, giving developers access to crash and freeze reports from users. Developers will be able to access these reports via their account on the Android Market publisher website. For a complete list of everything we’ve included in Android 2.2, please see the platform highlights. 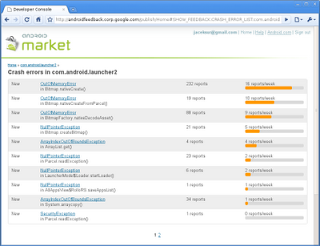 Developers can now download the Android 2.2 SDK and Android NDK, Revision 4 from the Android developer site. We are releasing new version of the Android SDK Tools, Revision 6, Eclipse plug-in ADT 0.9.7 and Android NDK, Revision 4. These new versions include support for library projects that will help you share code and resources across several Android projects. Workflow improvements The new NDK brings a host of workflow improvement, from compilation, to debugging. Starting with 2.2, the NDK enables debugging native code on production devices. ARMv7 instruction set support This release enables the generation of machine code for the ARMv7-A instruction set. Benefits include higher performance, as well as full use of the hardware FPU for devices that support it. 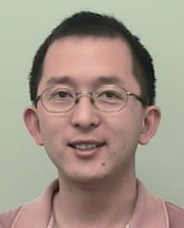 ARM Advanced SIMD (a.k.a. NEON) instruction support The NEON instruction set extension can be used to perform scalar computations on integers and floating points. However, it is an optional CPU feature and will not be supported by all Android ARMv7-A based devices. The NDK includes a tiny library named "cpufeatures" that can be used by native code to test at runtime the features supported by the device's target CPU. For more information, please see the releases notes for the SDK Tools, ADT, and NDK. Check out the video below to learn more about Android 2.2. Vincent Dureau, who’s in charge of Google TV, is a lean, bony-faced man with a strong French accent; not too far off my own age, I’d say. With the announcement imminent, he’s been too busy to write; I'm reporting on my talk with him to give a feel for the thinking behind the project. You’ll notice an absence of quotation marks; Vincent’s half of the conversation is reconstructed from the combination of my memory and notes. I think it’s accurate in essence, but certainly not in detail; among other things I can’t write with a French accent. Even two years ago you would have said that telephones are mostly for making calls, maybe for email and texting. Today, we know that phones can actually do a whole lot more. In the same way, people say that TV is just for watching TV. But, like the phone can be used for more than making calls, we believe that TV can be used for more than just video. Also, there’s not enough shelf space for the stuff on TV; not even with online channel guides and your PVR access and your racks full of disks. The shelf space should be as big as the web. They’ve always had access to the desktop. With mobile devices, they managed to get into your pocket. Google TV brings them into the living room, which is where people live. First, we have to make sure that most mobile apps work on your TV, too. Second, we should offer TV-specific features, like being smart about screen sizes, changing channels, embedding video streams, mashing up live TV and what’s on the PVR and what’s on the Web. The project started 2½ years ago, with a vision of a walled garden of TV-optimized web services. But the landscape keeps shifting, particularly in the capabilities of mobile devices. The only solution big enough for the problem is to bring the whole web to your TV. First of all, we run Chrome so we can ship both Android and web apps. Some will be pre-loaded; this is a moving target but we expect that Listen, Netflix, and Amazon Video On Demand will be on board. That’s irrelevant; the reason we’re building the SDK is to enable all those smart people out there that don’t work for Google to do cool stuff with TV. It should be pretty good; the device comes with an IR blaster and knows the IR interfaces for the popular satellite and cable boxes. You really should be able to get an integrated experience. 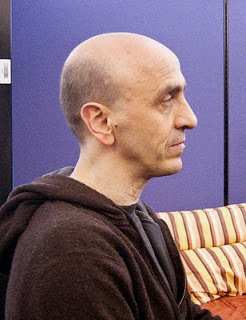 He’s the guy who pitched the project to Google’s executive team. He has been at Google for four years, and was hired to work on TV, originally ads. Working on TV is pretty much the only thing he’s ever done. Prior to Google, he worked on compression and DIRECTV. He doesn’t watch TV, he tests it. 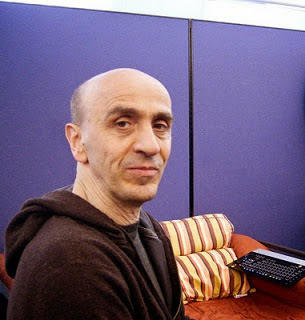 His popular test materials are Battlestar Galactica, Life on Discovery, Democracynow.org, Al-Jazeera’s newscasts (they have reporters more places than any other network); and, these days, the NBA playoffs. He does a lot more on his TV than watch TV; he uses it to run Pandora and Last.fm to hear the music through the nice speakers. Whenever he hears a tune he likes, he buys it right there & then from Amazon, which can get a little expensive. You can begin building optimized web apps today. If you’re interested in building Android apps, visit our Google TV homepage to sign up for updates on when the SDK add-on will be available. And if you’re interested in helping out in a broader scope, check out our Google jobs site and apply for an engineering position. A glance at the online documentation reveals an essentially-RESTFul API with JSON payloads, which should be easy to use from an Android app. It seems likely that a device which knows its location is a really good platform for building location-sensitive apps. Over at the Google Code Blog, there's a pretty significant announcement, about the release of APIs for Latitude. the idea, as you might expect, is that the best way to get good location-based applications is to put the tools for building them into everyone's hands. Along with our regular updates of the Android platform, we like to build example applications that showcase best practices for UI features and behavior patterns, to help our 3rd party developers create even richer applications. For example, the Twitter for Android application that we worked with Twitter to design gives you, the 3rd party developer, a working example of how you can customize and build an application that’s both fun and highly functional. This blog post is meant to showcase these patterns along with some recommended implementations as you start to develop your applications around them. Let’s get started and explore these patterns in more detail now. 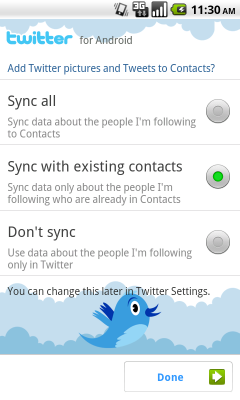 One of the most important intents we added to Twitter for Android was the ability to sync your Twitter contacts into the phone. 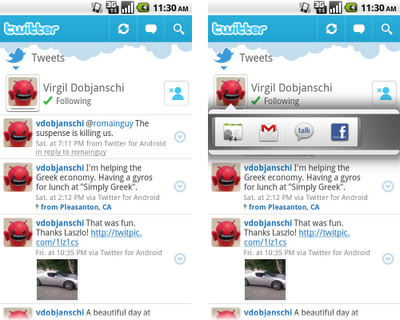 This integration also allowed us to give Twitter users with an Android phone the use of the QuickContact widget, which gives users a choice of ways to contact their followers. Using this activity upon first signing into an application. If your app has no sign-in, showing this screen at first launch to improve discoverability of contact sync. The good news for developers is you get this highly functional contacts feature for free if users choose to sync contact information into your app. QuickContact for Android provides instant access to a contact's information and communication modes. 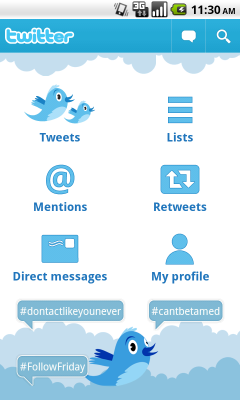 For example, a user can tap a contact photo and with one more tap launch a call, SMS, or email to that person. Other applications such as Email, Messaging, and Calendar can also reveal the QuickContact widget when you touch a contact photo or status icon. The dashboard pattern serves as a home orientation activity for your users. It is meant to include the categories or features of your application. We recommend including an Action bar on this screen as well. The dashboard can be static or dynamic. For example, in the case of our dashboard for Twitter, we used the goodness of Live Wallpapers introduced in 2.1 to create an animated dashboard complete with real-time trend bubbles and the Twitter bird silhouette. Using this pattern to showcase the most prominent features of your app. Adding some unexpected delight to this screen, making it engaging without overwhelming the user. Exercising caution - for some apps, the user will want to jump directly into the meat of the application. For others, this sort of welcoming dashboard will be the right starting place. The Action bar gives your users onscreen access to the most frequently used actions in your application. We recommend you use this pattern if you want to dedicate screen real estate for common actions. Using this pattern replaces the title bar. It works with the Dashboard, as the upper left portion of the Action bar is where we recommend you place a quick link back to the dashboard or other app home screen. Placing an Action bar at the top of the screen to house the most common actions for your application that work across all activities. Using no more than 3 onscreen actions for the Action bar. Use the main menu as overflow for actions that are less important. The balance between Action bar and main menu will ensure the richness of interaction that is Android. Making the left-hand region actionable, offering one-touch return to your dashboard or other app home. The Search bar pattern gives you a fast way to switch between resources that are searchable by your application. 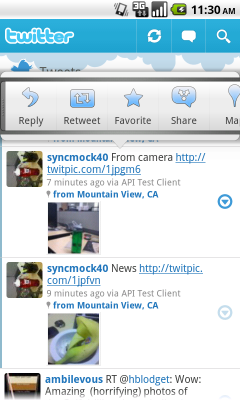 For example, with Twitter for Android, we used the pattern to support searching within Tweets as well as People. When triggered, this pattern sits on top of the Action bar. You keep a search history so users upon returning to the search activity can have quick one-button access to previous searches. QuickActions is our newest UI pattern. Currently, it has been implemented as a fast, engaging, popup triggered by an onscreen UI element that identifies it in as minimally disruptive way as possible. We recommend you use this pattern for list views that are data intensive where items inside the list have contextual actions associated with them. QuickActions can be used as a replacement for our traditional dialog invoked by long press. By choosing to use this pattern as part of a list, we made it easier for Twitter users to take action on the information in the list view by keeping the item and associated actions in context. We also took the extra step of making it easier to target links in list views by turning off the list view button element as a secondary component to making this pattern even more usable. This way users of Twitter for Android can view links with one tap and/or see the posted tweet on a map by tapping the tweet meta data directly. Creating a UI element that is minimal and recognizable as an action popup; either a frame around an image or an icon in a list item. Only using this pattern in applications where the data is intensive. Placing the action popup below or above the information you wish to allow users to take relevant contextual actions on. This will make it easier to associate the actions with the content in view. Turning off the entire list view button element so that regions can be easily targeted for the user. The companion widget pattern is something we recommend all developers think about deeply. The widget you create should be more than a big button link into your app. Used correctly, it can provide a place on a home screen that personalizes, albeit in a small window, your application. 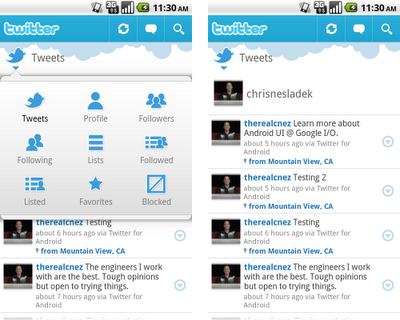 In the case of Twitter for Android, we designed and built small and large-sized widgets to support different types of functionality. 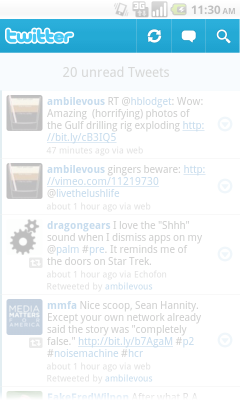 Both widgets let a user view his/her tweetstream. However, the smaller widget hands off to the application to create a reply to a tweet from the stream, whereas the larger one gives direct access to the Tweet compose activity. Make this more than a button into your app. Give your user an action or view into the app itself. Keep the activity stateful so that on exiting the application and re-entering a user is returned to the same context in the activity, minimizing the impact of using the dashboard if it is used. Don’t think we quite got something right? As many of you know, we’ll soon be open sourcing this application code under the Android Open Source Project. We look forward to seeing what you can build starting from this code these UI patterns. In the meantime, Happy Tweeting! 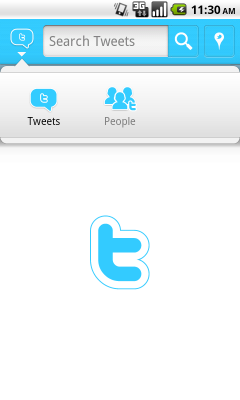 Twitter for Android is available in Android Market for immediate download. It is compatible with Android 2.1/2.0 devices, with support coming soon for more. Come check out the Android UI patterns session at Google I/O next week to learn more about how this applies across our framework and not just in the Twitter app. Billy: The Android Developer Lab (ADL) events are sponsored by Google to help drive developer interest in the Android platform and increase the quality, as well as quantity of creative, innovative applications in Android Market. This Android Developer Relations tour covered 18 locations around the world; we met with over five thousand enthusiastic Android developers and were thrilled to see the energy and creativity behind your applications. Reto: The European leg of the Android Developer Lab World Tour consisted of me, Billy, and intrepid local volunteers covering eight labs in eleven days across six countries. Some of the venues weren't like some of the others. The goal of the tour was to meet and support local Android communities around the world, get developers excited about Android, and inspire them to create the next generation of innovative mobile applications. Reto: The odyssey began in the London Google office, three labs over two days that played host to nearly 200 developers. Our surprise gifts arrived minutes after our first session started - a close enough call that our “there’s a package you need to sign for - any idea what it is?” charade was unscripted and only partially contrived. The heart palpitations were entirely real. London is home to some great Android developers including the teams behind ADC2 winners PlinkArt and BuzzDeck. After London we battled ice and snow in Stockholm, where Anders Bond told us why Android is a good match for Spotify, and enjoyed the sound of 100 Swedes spontaneously erupting in applause. In Paris 200 experienced community members joined us for two events at La Cantine. Speakers from FRAndroid, Sfeir, and Diotasoft covered everything from OpenGL development using the SDK to using AppEngine to create scalablends for your Android apps. The Berlin event was huge, with over 150 developers travelling in from all across Germany. We saw demos including multi-touch pong, a Live Wallpaper of the changing Berlin skyline, and an app that showed us where to find (and rate!) the nearest public toilets. The night ended (in the small hours) with a private tour of c-base, an experience not to be missed. Universidad Rey Juan Carlos made us feel very welcome in Madrid. Over 200 developers from across Spain (and Portugal) were in attendance including more winners of ADC1 (Biowallet) and ADC2 (SweetDreams). Billy: Developers have matured to the point where they don't need to be convinced, they hunger for more technical details. While the intro level topics were well received, most developers have advanced beyond this point and seek guidance on more in-depth topics. 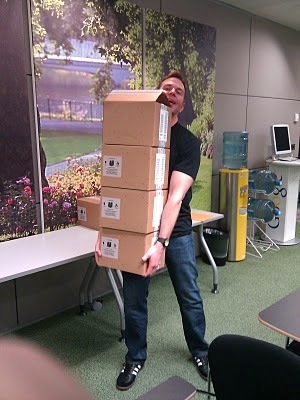 It’s possible for one person to carry up to four boxes each containing ten Nexus Ones at a time. You should not try to carry more than three boxes of Nexus Ones if the conditions are icy. Right Billy? Announcing free smartphones to a room of developers always results in a spontaneous round of applause. European mobile developers are smart, enthusiastic, and already building the next generation of epic apps for Android. 79% of developers say having Google engineers on hand is "extremely important"
Billy: The Android Developer Relations team plans to lead future Android Developer Lab events in 2010, building on the feedback from the February events. 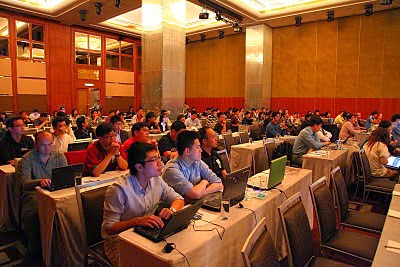 These future events will focus on deeper technical subjects, expecting the attendees to have a basic understanding of the Android platform. We will post the beginner material on-line as a prerequisite. While it's impossible for us to reach all locations, we'll look to cover the key locations where Android devices are available. Reto: I hadn’t even made it back to London when the requests started to roll in. Given the success of this tour I don’t imagine it will be too long. It’s always a great experience meeting the Android developer community, we look forward to seeing you again soon!